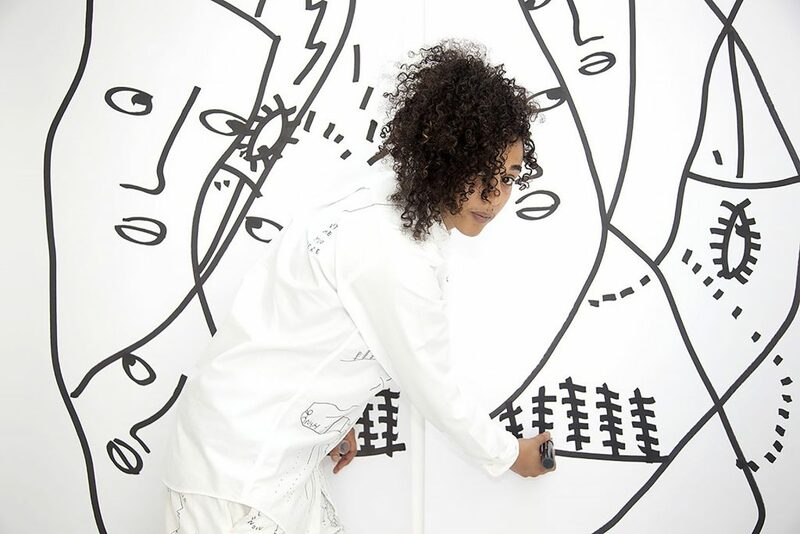 Shantell Martin is a visual artist based in New York best known for her stream-of-consciousness drawings. 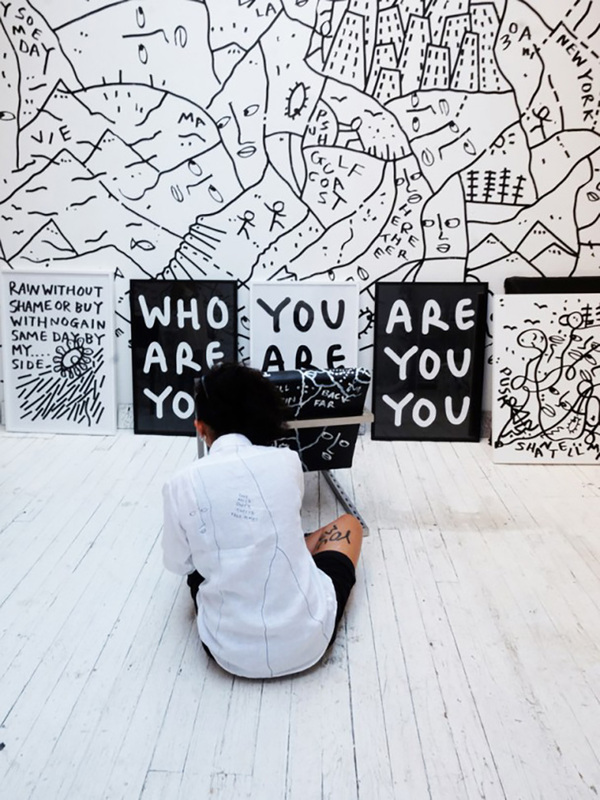 Using her simple trademark—black ink and white surfaces—Shantell’s illustrations have transformed everything from walls, found objects, ceramics and sneakers into a visual narrative. Her hand-illustrated bedroom walls appeared on the cover of the New York Times home section in May 2012. Room & Board has long supported non-profits dedicated to strengthening home and family, as well as organizations that support those living with AIDS and institutions celebrating art and design. 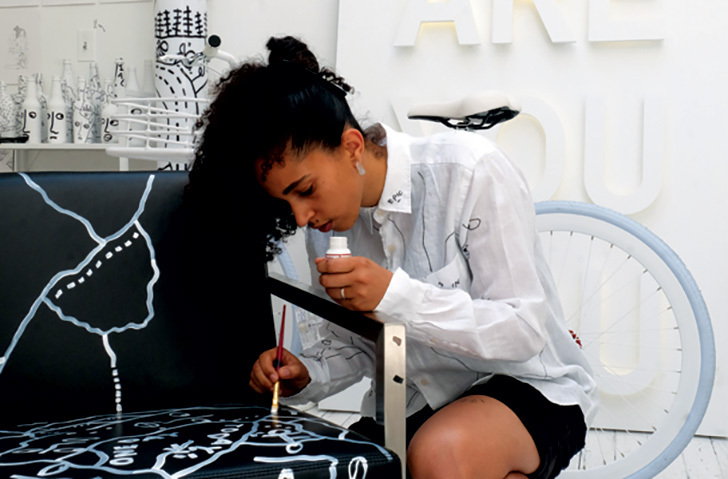 When amfAR asked us to donate a (black or white) furniture piece that would be adorned by Shantell and auctioned off for charity, we jumped at the opportunity. Here are some behind-the-scenes photos of Shantell transforming our Lira leather lounge chair in her Tribeca studio. The online auction, powered by Artsy, will also feature artworks by Robert Beck, William Eggleston, Steven Klein, Brett Lloyd, David McDermott and Peter McGough, Robert Rauschenberg, Cindy Sherman and Sam Taylor-Johnson. Bidding opened June 16 and closes June 30 at 12 p.m. ET on Artsy. 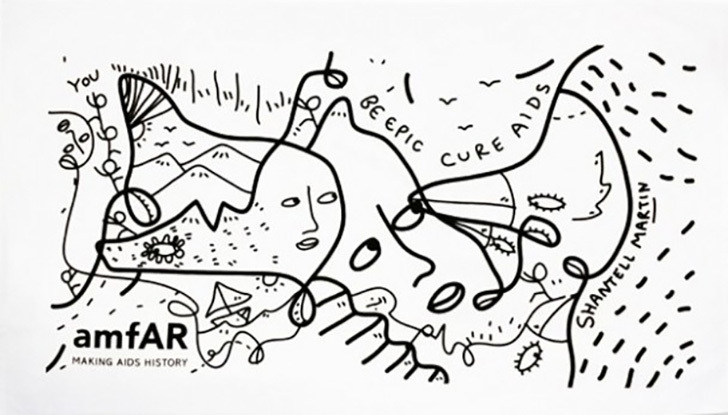 Shantell’s creation will be on view at the amfAR generationCURE Solstice Auction event tonight at The Hudson Hotel in New York City, where guests may place bids online for the chair along with the other art pieces via Artsy kiosks and mobile phones. 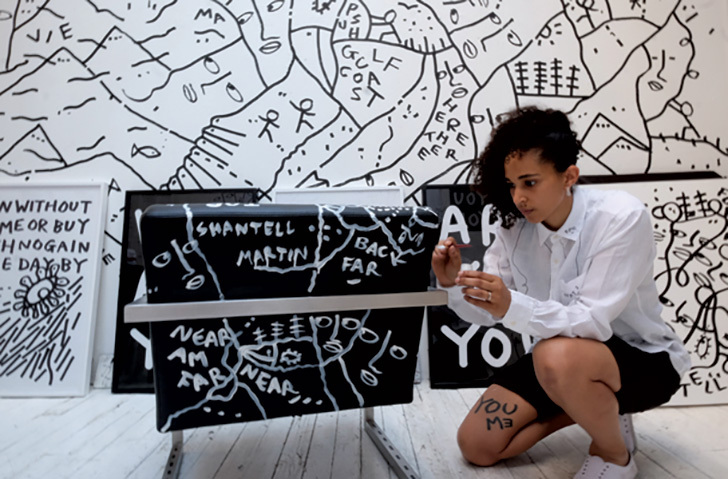 We took the opportunity to connect with Shantell to learn more about her background, inspiration and drawing process. Shantell Martin is an interesting character; each day she begins with a series of sneezing. She seems to cope very well at being both a very serious, practical person, while at the same time being a big kid. Never really showing the world when she is extremely excited or disappointed. Shantell loves to learn, to talk with people who know more than she does about pretty much any subject, she is hardworking and kind, sometimes she has more energy than she knows what to do with it and when given the chance will dance around a room to exert some of that extra energy. She is ambitious and loves the idea that we are always growing our capacity to be better kinder human BEings. It was probably more like nine or ten when I started to think I could grow up to be something and for me that something was a runner or/and a cartoonist, not sure I understood the actual job roll of a cartoonist back then, but I did watch a lot of cartoons, which I thought was more than enough skill needed for the job. Not sure at what age I started drawing, but I remember being around seven years old when I realized it was a perfect way to escape, to control, to daydream. Pretty much no matter what the scale or the surface is I start practically all my drawings with an initial line; I call this line the DNA this is the foundation, the structure, the thread that holds the drawing together. After I’ve drawn the DNA I look for clues in the lines like you would in a crossword puzzle. For example if there is a smooth line that looks like the side of a face I will draw a mouth then a nose and then eyes, if there is a part of the line that looks like land I will draw trees, then the sun and then birds and so on until I get this STOP feeling that tells me that the drawing is complete. Sometimes I find it odd that we feel we need to go somewhere or do something to be inspired, yes there is definitely inspiration out there in the world, but there is also a lot of inspiration in there too. I like to wonder around my thoughts, my memories, I work on my daily life at being a more understanding, more compassionate, less reactful human being, I try to eat, drink and think well, I try my best at being a better version of me: all which is incredibly hard work, but all that work can help inspire you in your life, with your goals and in your career. Take us inside your studio space. You walk in and are hit by how light and bright the space is, you look up to see a large skylight above you, then down, you see a series of black and white objects, art pieces, wall drawings, airplanes, along side light pieces that say things like ARE YOU YOU and YOU ARE WHO. The space makes you feel relaxed and calm, you feel free, you begin to take a second closer look and discover another world, another level of drawings and stories. A form of understanding, of questioning, of expression, it should be something that is inclusive. How has your time spent in Japan influenced your art? Living in Japan mostly influenced me in the sense that it gave me space to feel free, a space to discover more about me. I moved there right after school in 2003 and found myself in a place where for the first time no one knew me, there were no friends or family in sight, no one was projecting on me who they believed me to be and I was not living up to or filling in any roles that have already been carved for out for me. I really had a chance to discover, to learn, to forgive, to grow in Japan, which really fundamentally helped me as an individual. If I were to describe my job, it might look a little like this: Travels around globe, draws on everything, meets amazing people, talks at conferences, teaches at renowned intuitions. Responsibilities: Be you, have fun, be professional, learn a lot, give a lot, don’t forget to love what you do. Super minimal, strong bold lines and shapes. For over 10 years (maybe even longer), I had had a comb hidden in my hair and a pen in my pocket. I’ve always loved Saturdays. I remember waking up super early as a kid to go watch cartons and eat cereal. Now I still wake up early, but will normally head to the studio early to knock out a bunch of work. Now not much, I’ve been working towards the opposite for many, many years. However, if you asked me what I ‘used’ to collect I could be here all day typing a long list of stuff. What advice would you give struggling artists who believe they are following their calling? Plan A has to be the same as plan B and C. When you see your friends go off and get good paying jobs, start to buy homes and cars and you’re sleeping on a couch, you have to trust that it will work. You have to also make sure that you not only have the talent you need, but also work on being organized, social, kind, professional. The days where an artist could just make art and be successful are all but gone, now it’s a whole package, a whole list of skill sets you need to require.